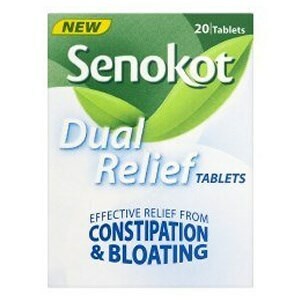 Senokot Dual Relief contains the only formulation to treat both constipation and bloating. It contains natural senna to relieve constipation with added fennel to relieve bloating. Contains: Senna leaves tinnevelly BP 100mgAloes (cape) BP 45mgCascara bark BP 30mgDandelion root 30mgFennel seed 15mgOther Ingredients:dicalcium phosphate, sucrose, talc, magnesium stearate and sodium starch glycollate. Adults: Take one or two tablets at bedtime when necessary.Children: Not recommended. Thank you for your interest in Senokot Dual Relief Tablets. Enter your email and we'll contact you as soon as it's available again.